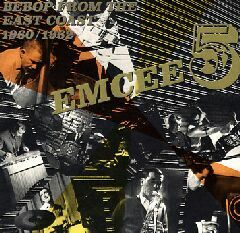 The EmCee Five enjoyed great popularity in the Newcastle area in 1960 but by late 1961, when they made the Columbia record, were virtually inactive and the break-up began. The group had made great strides in their short working life and had outstanding soloists in Gary Cox, Ian Carr and Mike Carr. Malcolm Cecil, (whose initials the group were named after), and Ronnie Stephenson moved to London and Ian Carr followed in 1962. With the exception of the Columbia record date all their records were made in Newcastle. The group never came to London although many feel they were just as good as the top London names of the time. Mike Carr (p), Malcolm Cecil (b), Ronnie Stephenson (d). Gary Cox (ts), Mike Carr (org), John McLaughlin (g), Jackie Denton (d). A little bit of history! One of the most important bands to ever emerge from the regions - a kind of British territory band. Newcastle's EmCee Five originally featured the Carr brothers - Mike (piano) and Ian (trumpet), the fluent saxophonist Gary Cox, bassist Malcolm Cecil and drummer Ronnie Stephenson... there's excellent soloing all round, but most remarkable is how completely the contemporary American music had been absorbed in to the sound of the band. The ensembles would do any Blue Note session proud. Indispensable! This album, issued on CD for the first time, shows how advanced the Carrs were. Their music, with its turbo-charged drive and impeccable handling at high speed, still sounds fresh today. Tenorist Gary Cox's solos also wear well and one interesting track features a teenage guitarist named John McLaughlin. Whatever became of him? A great set of Brit jazz from the early 60s... with that sense of tightness that made the British scene so great at the start of the 60s.